Direct from China, following years of touring around the world, the Yinchaun Art Theatre transports their entire troupe of 50 actors and actresses, for their appearance in the United States for the first time. 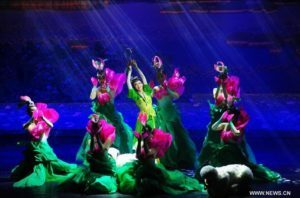 As Dan Funes, the “Moon over the Helan Mountain” show producer, explained, “Like the Silk Road’s early caravans, we are bringing the cast of 50, costumes, back drops, lights, projection equipment and support people to Las Vegas. A lot of our dances are lifted from the Silk Road’s rich history representing traditional dances. This is the first drama of this region from such a massive country with many sub-cultures within it is like showing a sliver of that culture under a microscope. People think of Marco Polo and the Silk Road but it goes way back before him. Sandy Z. called the show a happier version of “Romeo and Juliet” while Dan Funes said, “It is not as tragic as “Romeo and Juliet”. After seeing one of their video promos, I can say, “What a wonderful production and what a talented cast!” You can turn to www.youtube.com and search for “Moon over the Helan Mountain” to see several videos for yourself. The setting for this show is Marco Polo’s ancient Silk Road located in the isolated northwestern deserts of China, by the Helan Mountains and the Yellow River Plain (in today’s Ningxia region and entrance to Inner Mongolia). 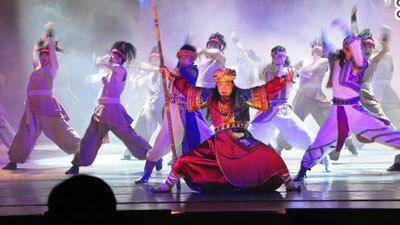 The story focuses on the nomadic Hui tribe, one of China’s 56 ethnic groups. A happier ancient version of William Shakespeare’s much later “Romeo and Juliet”. I visited China 5 times producing television travel specials and also filmed in Marco Polo’s Silk Road, the setting for this production. This is a love story between Na Su (a young merchant) and Hai Zhen (a local girl) daring to break the boundaries set by their religions, wanting to marry against their families’ wishes. 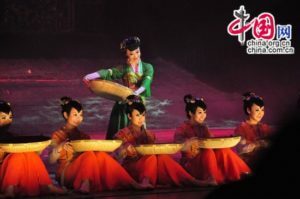 The “Moon over the Helan Mountain”, a musical drama for the whole family, appears twice each night for two nights (1 hour:40 minutes): April 2: 5-7 pm & 8-10 pm; April 3, 5-7 pm & 8-10 PM in the Showroom at the Orleans Hotel, 4500 West Tropicana Avenue. Call: 800-745-3000. Award-winning Talk Show Host/Columnist Sandy Zimmerman has produced television programs for 20 years, is also a syndicated Show and Dining Reviewer, Travel/ Luxury writer, as well as a Photographer/ Videographer, Director, and Talk Show Host of Sandy Zimmerman’s Las Vegas TV Show and Discover the Ultimate Vacation travel specials. For information, questions, comments please contact Sandy Zimmerman at sandyzimm2003@yahoo.com 702-515-0846.